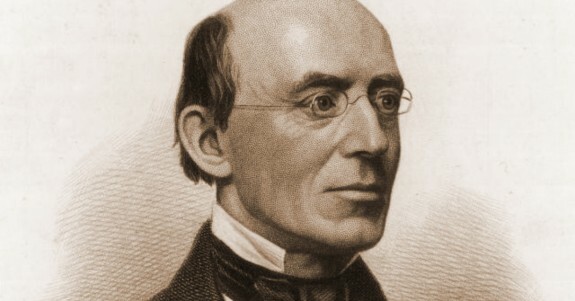 William Lloyd Garrison was born in Newburyport, Massachusetts in December, 1805. At thirteen years of age he began his newspaper career with the Newburyport Herald, where he acquired great skills in both accuracy and speed in the art of setting type. He also wrote anonymous articles for the paper. He began writing for and eventually became co-editor of the Quaker Genius of Universal Emancipation newspaper in Baltimore. Garrison’s experience as a printer and newspaper editor allowed him to revamp the layout of the paper and freed Ben Lundy, his co-editor, to spend more time traveling as an anti-slavery speaker. While working for the Genius, Garrison became convinced of the need to demand immediate and complete emancipation and rejected Lundy’s differing view that emancipation could come about gradually. Rather than leaving the paper, both editors continued to espouse their views and started signin their editorials to make it clear to readers. Garrison introduced a regular feature to the Genius that he called “The Black List”. This column was devoted to short reports of “the barbarities of slavery — kidnappings, whippings, and murders.” One of Garrison’s “Black List” columns landed him in legal trouble when he reported that a shipper, Francis Todd, from Garrison’s home town of Newburyport, Massachusetts was involved in the slave trade, and that he had recently had slaves shipped from Baltimore to New Orleans on his ship Francis. Todd filed a libel suit against both Garrison and Lundy. Francis filed in Maryland in hopes of securing a favorable verdict in that state’s pro-slavery courts. The state of Maryland also brought criminal charges against Garrison, finding him guilty and ordering him to pay a fine of $50 and court costs. Garrison, unable to pay the fine, was sentenced to a jail for six months. After serving seven weeks of his sentencer the antislavery philanthropist Arthur Tappan paid his fine. During his time in jail Garrison had decided to leave Baltimore for Boston and he parted ways with The Genius. Subscribers to Accessible Archives can search the full text of his thirty four years of work that only ended when the Union won the Civil War in 1865. His first issue opened with this, The Salutation. To hurl my shafts at freedom’s deadliest foes! Flow but for cement to her offspring’s chains? On other shores, and thou ask no redress? Would thy heart bleed- because thy face is white? At him who bears her off to life-ling wo? Stretched out in rest, which hence, must end for him? Man to his kind! Then, thy professions save! Forswear affection, or release thy slave! Ask if Heaven takes such offerings as thine! Far higher than thy prayer his groan will rise! The prison-doors unbarr’d–the bondmen free! Than to behold the oppressor’s sacrifice! Make man consent to see his brother cursed! They shall cry ‘more!’ while vengeance bids thee burn. The Lord hath said it! — who shall him gainsay? They are the oppressors of their fellow man! Which gives me strength my purpose to pursue! With Africa’s cries to have her sons unbound?